The IQBoard has just got smarter with the launch of the IQBoard IR. The IQBoard IR retains the excellent hotkeys and IQBoard software and adds the latest multitouch and dual user functionality. The size is increased to 82″ diagonal and the price…..is reduced even further from only €2060 including VAT and installation with a high quality Short throw projector and powered wall mounted speakers when purchasing 2 or more systems. 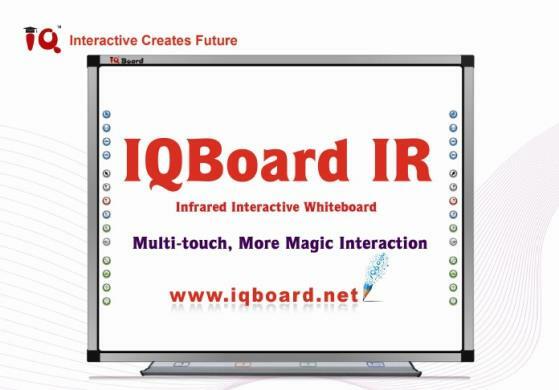 The IQBoard Interactive Whiteboard is ideal for teachers in schools and colleges in Ireland. This touch sensitive premium board is probably the best board on the market. Dry Wipe markers can be used and the accuracy of control is leading edge. The software outperforms many of the leading boards. ” Best value I’ve seen for a short-throw solution of this quality”. The IQBoard is 1 of only 6 products to get 5 Stars. It is €250 less expensive than its nearest competitor. IQBoard is touch sensitive premium board is probably the best board on the market. Dry Wipe markers can be used and the accuracy of control is leading edge. The software outperforms many of the leading boards.